Thoughts on "Ticket to Ride: Mystery Train Expansion"
The game won the 2004 Spiel des Jahres, which is somewhat like the Academy Award-equivalent for boardgames. 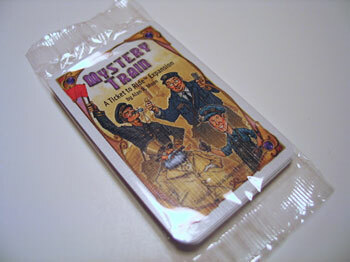 That same year, the first expansion for the game, Mystery Train, was released. The expansion was originally available for free at game trade shows and via magazine inserts. The maker of Ticket to Ride, Days of Wonder, also sold it for a short time via their website. Eventually the expansion went out-of-print, but then was made available as a PDF download on their website. I printed my set on some card stock and it has worked out well. But what exactly was this first expansion to Ticket to Ride? Simply put, it was an additional set of 10 cards that you added to the stack of Destination Tickets from the original game. The purpose of the Mystery Train expansion was to solve a problem that had developed in the original version of Ticket to Ride, namely that players were afraid to draw extra Destination Tickets during the game (which in turn would give them more points, but also possessed a risk if a route could not be finished at game's end). Mystery Train sought to encourage additional Destination Ticket selection by a sheer act of bribery! Basically, it tried to present the situation that drawing more Tickets was good because you are probably going to get something positive out of doing so. There was less risk involved, thus this opened the door to lessen the worry regarding this aspect of the game. While playing your turn during Ticket to Ride, you can do one of three things: (1) Claim a route on the gameboard via placement of your little plastic trains, (2) Drawing additional Train Cards to enable you to claim more routes, or (3) Draw additional Destination Tickets, which if completed by the end of the game, provide you with a point bonus. When you draw Destination Tickets during gameplay, you are allowed to pick up 3 new Tickets, with the requirement that you only keep 1 (or up to all 3 if you want). Mystery Train tried to "sweeten the pot" by providing you bonus elements that made it worth the risk of drawing new Destination Tickets. The 10-card expansion consisted of 2 types of cards, new Character Cards and some regular Destination Tickets. 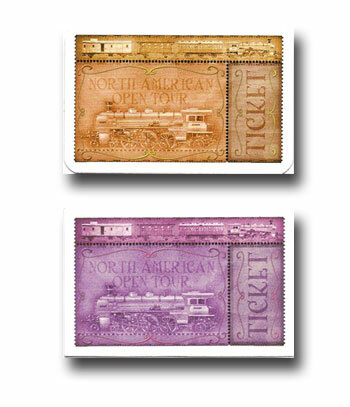 As an incentive to show you that something good might be coming, the backs of the Mystery Train cards were colored purple vs. the standard light tan color. Thus, after they were shuffled in with the rest of the Destination Tickets, you could clearly see if one of the "good" cards was coming up for draw soon. For example, if a purple card was near the top of the deck, you may choose to take the risk and select more Destination Tickets on your turn, hoping to get something good. Reveal this card at the end of the game. If you have visited the most cities during the game, add 10 bonus points to your score. If you are tied for the most cities, you (and only you) still get the bonus points. A city is deemed visited if a train of your color sits on one of the tracks adjacent to it. Reveal this card at the end of the game. You may double the value of any one of your Destination Tickets worth 10 points or less. Play this card in lieu of your regular turn, when deciding to draw new Destination Tickets. Instead of picking the top three, pick any one Destination Ticket of your choice from the pile of remaining tickets. Reveal this card at the end of the game. If you have a West Coast City (Vancouver, Seattle, Portland, San Francisco or Los Angeles) connected to an East Coast City (Boston, New York, Washington, Charleston or Miami), add 10 bonus points to your score. Politician – Collect 5 points if one of your routes connects to Washington D.C.
Taken as a whole, you can see how this addition to the game would help encourage selection of Destination Tickets. Say, for example, it's your turn, there's a purple-backed card near the top of the Destination Tickets pile, and knowing that there are cards in that pile that could help you with your point count, you take the risk and pick up 3 cards, one of which is a Mystery Train ticket. Anyway, that was the general logic behind this 10-card expansion when it was released in 2004. If you had been playing Ticket to Ride for a while, it added some new life and strategy to the game, long before additional versions had been released. Looking back, this expansion had some positives and negatives. On the plus side, some of the features that it introduced were incorporated into later versions of the franchise. For example, the inclusion of a batch of short routes counteracted one of the criticisms of the original game, namely that the only way to win was by building horizontal long routes across the map. When Ticket to Ride: Europe was introduced a year later, it reflected this by separating the Destination Ticket deck into both short and long routes. The 4 new Mystery Train Destination Tickets also reappeared later in the Ticket to Ride: USA 1910 expansion, along with a version of the Station Agent card, granting points to the player that had completed the most Destination Tickets. However, some attributes just didn't take, namely the concept of Character Cards. Some of their attributes were adapted by different game mechanics in later versions, but the idea of a card you pulled and held to accomplish a "power" was dropped. One of the largest outcries against the Mystery Train expansion (at least according to the feedback on BoardGameGeek.com, which seems to be the Internet hub on the topic) was the hatred of the Engineer cards, which were often deemed too powerful. I can attest this from personal experience, as Amy has won quite a few games thanks to the ole Engineer. If you modify the card slightly via house rule (such as capping the number of cards that can be pulled from the Draw pile vs. looking at the entire pile), it becomes more balanced. Interestingly, nowadays you can only use the original Mystery Train set of 10 cards with the inaugural version of the game, namely with the small playing cards. All versions of Ticket to Ride that were released after the original USA map version featured enlarged train cards more akin to the dimensions of a standard playing card deck. Mystery Train was never reissued in a larger size, thus it's only compatible with the original version of the game. Still, if you are looking to add a little more spice to your Ticket to Ride playing, consider using the Mystery Train expansion to change things up a bit. What do you have to lose, it's a free download after all! If you give it a try, share your experiences here and let us know how it worked for you. Tips from Steve & Amy: Having played with Mystery Train quite a bit, here are a few suggestions to make your experience fun. First of all, we really like using the "Hobo" or "Controller of the Railway" options for the "Blank" Character Card (especially in a 2 player game). Additionally, we agree that the Engineer card is too powerful, thus we apply a house rule when playing. The original Engineer rule states "Instead of picking the top three, pick any one Destination Ticket of your choice from the pile of remaining tickets." This seems to really favor those who have this card in their hand, as they are able to go through the entire deck to cherry pick the best card for them. Thus, to make gameplay more balanced, we like to change the rule to "Instead of picking the top three, draw the next 6 Destination Tickets from the pile of remaining tickets and keep one." This modification still honors the spirit of the Engineer card, but does so with more restraint. 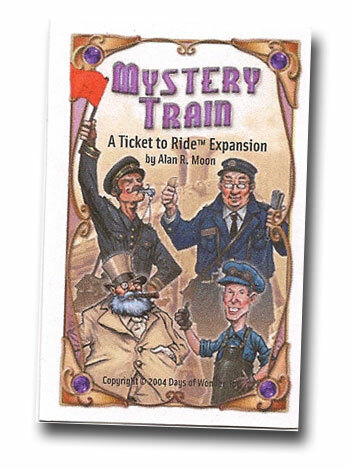 Finding the Expansion: Mystery Train is officially out of print, but Days of Wonder made it available as a free PDF download for a brief period of time. As of May 2010, however, it disappeared from their website. I e-mailed their Customer Support to inquire. Their response was that "Support for this expansion has been discontinued." Fortunately, I have archived the PDF download pages, so you can still get the free expansion via this mirror site here at TannerWorld. Enjoy!